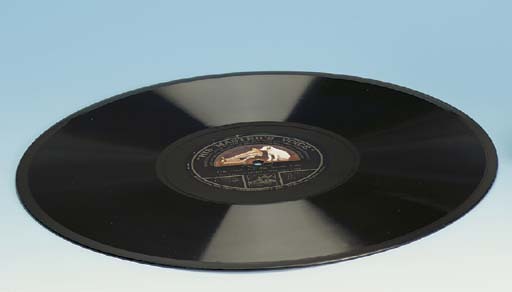 A 78 rpm voice phonograph record, black paper labels printed in gilt with His Master's Voice logo printed in colours, side A: 'The Discovery of the North Pole/Commander Robert E. Peary'., side B: 'The Dash for the South Pole/The Late Sir Ernest Shackleton', catalogue number D 377 01035 and 01028. The Gramophone Co., Ltd., Hayes, Middlesex, England: [circa 1922 or later], 11 13/16in. (30.1cm.) diameter.